Securing Laserfiche buy-in from all departments within a large organization can be a challenge. One way to encourage others to adopt Laserfiche is to demonstrate a clear return-on-investment (ROI). Here is how we created a cost-benefit analysis to help justify further investment in Laserfiche by other departments within PSALM Corporation. What information do you need to create a cost-benefit analysis? How many employees dealt with documents on a daily basis? On average, how many documents were retrieved, copied, scanned and stored daily? How long did it take to process those documents? 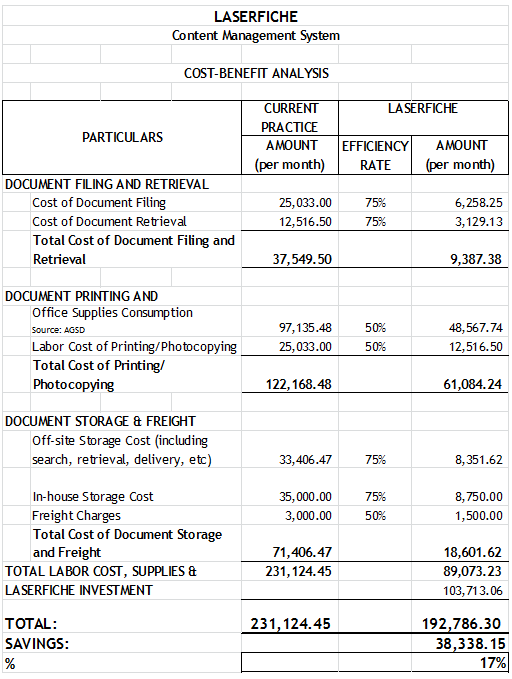 How much did your Laserfiche implementation cost? How much time did you save on document processing (retrieving, scanning, copying and storing)? How much did you save on hard costs (paper, freight charges, storage charges, printer maintenance)? Next set a timeframe for which you will generate the cost-benefit analysis. We chose a month, but you can choose whichever timeframe works for you. How do you put together a cost-benefit analysis? It is now time to compile all of this information into one document. Note: The process described below relates to our particular case—your analysis may look different based on your organization’s business requirements. Document storage and freight charges. Laserfiche investment (expenses associated with Laserfiche implementation). 2. In each section, we inserted one column for expenses associated with the pre-Laserfiche practice and another column for the expenses post-implementation. 3. In order to calculate the post-implementation expenses, we used an Efficiency Rate (a rate by which time or expenses were reduced after implementation of Laserfiche). We obtained this rate from a consulting firm and then modified it based on our own experience. The Efficiency Rate varied by process. Example: To analyze the cost of off-site storage we took into account both the monthly cost of renting the storage facility and the cost of document retrieval. Since we are now only storing 25% of all hard-copies of documents in the facility, we used an Efficiency Rate of 75%. We calculated the post-Laserfiche expense by using the formula described above. 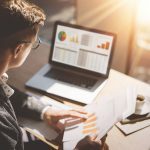 Calculating ROI is just part of the research that should be done when considering Laserfiche, or any document management vendor. To make sure you select the right vendor for your organization, download the free, complete guide to document management.